I start my second semester of my marriage and family therapy master's program this month. This is the semester we must find our "fieldwork placement," the community site where will be seeing our very first clients. It is, of course, an intimidating proposition. I'm not afraid of seeing my first clients--coming to this career later in life has afforded me the advantage of being already familiar, through 35 years of life experience, with much of what we're learning in our classes. However, I am still wandering into uncharted territory, and I have to admit to feeling nervous and slightly unmoored. I have such reverence for the science and craft of therapy, and I want to honor my clients' courage in seeking help by doing my best work. We've been getting a lot of warnings about how everyone feels trepidation as they begin to see clients and that it's easy to feel overwhelmed by the process, especially in the early sessions. Recently, I stumbled across this blog post which simultaneously relieved and agitated me. On the one hand, it is written so bluntly and honestly that I feel like the author is sharing their honest truth without trying to spare my feelings, so I have a more fuller understanding of what is waiting for me on the other side of the office door. On the other hand...it makes the experience of a beginning therapist seem dire indeed. It certainly increased my anxiety level. Which is why it was such a relief to read Mary Pipher's warm and generous Letters to a Young Therapist. This is a memoir and manifesto in the form of a series of letters from the author to her favorite graduate student, who she describes as "like most young therapists, a funny mix of scared and overconfident" (p. 44 of the ebook). That she described the exact combination of emotions I was feeling as "a funny mix" instantly soothed me a little. Pipher shares her experience of being a therapist as well as lessons she has learned over the years. Most encouragingly, she writes of her love of being a therapist--even after so much time and so many clients. When asked if it's depressing to listen to people talk about their problems all day, she responds, "I am not listening to problems. I am listening for solutions" (p. 2). The optimistic reframe inspired me, as did her follow-up assertion that it has been her experience that clients generally want help, are ready for change, and do, in fact, make positive changes in their lives as a result of the therapy process. It's worth it, she seems to be saying. She does not shy away from how difficult and complicated the work can be. She shares wisdom on deep topics (family dynamics, pain, happiness, and handling failures, to name a few) as well as more practical matters, like protecting one's own safety and attention to self-care. 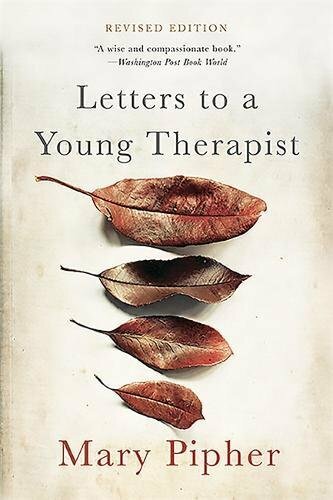 It's a thoughtful, nuanced, and detailed account of how the author's experiences have shaped her, and reveals the myriad ways we new therapists may well be shaped by the work before us. If you're feeling a little overwhelmed about beginning to see clients--or even if you're feeling a bit of burnout and need a fresh perspective on the practice of therapy--I would definitely recommend reading this book. It may even inspire you to write some letters of your own (or a blog).